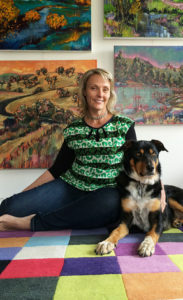 Nicole Foxall is a colour junkie who loves injecting hefty doses of pigment and vibrancy into her paintings. Her mission is to express and create from the world around her and bring colour and happiness to people’s walls. Nicole’s painting process is loose and spontaneous with each piece a unique translation of the subject. Nicole works out of a backyard studio which she shares with her husband who is also a painter and creator. She sneaks out to paint when her two children are otherwise engaged and is often accompanied by a treasured “Studio Dog” named Scooby who provides generally positive critiques.